Cuautitlán, Mexico State.- Earlier today, President Felipe Calderón inaugurated the Lechería-Cuautitlán Stretch of System 1 of the Suburban Train, a work regarded as a step in the direction of a more modern, safer and more efficient transport system. Accompanied by Governor of the State Enrique Peña Nieto, the President reported that this stretch, which will run 27 km from Buenavista to Cuautitlán, involved an investment of over $14 billion pesos, 56% of which was private and 44% public. He pointed out that from now until 2012, Federal Government will assign over $140 billion pesos to Mexico State for infrastructure. He added that operating the train will create four thousand direct jobs and approximately 10,000 indirect ones and provide service for nearly 300,000 passengers a day, which will reduce traveling time from 3 hours to 25 minutes. “Works such as this constitute firm steps towards the development of a far more modern, safer, more efficient and faster urban transport system which will improve the quality of life of all the inhabitants of this great city,” he added. 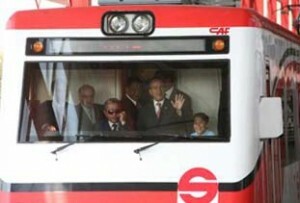 President Calderón went on to say that improving the transport system will contribute to the conservation of the environment, since these measures will discourage car use, thereby improving the flow of traffic. “One of the most important steps civilization must take in the fight against climate change and global warming is to improve collective transport systems rather than individual transport systems, in other words, car use,” he explained. He mentioned that two other systems are underway, which will run from Martín Carrera to Jardines de Morelos and from Chalco to La Paz and Ciudad Nezahualcóyotl. The President highlighted the achievements of the National Infrastructure Program and recalled that in his government, approximately 100 kilometers of urban rail transport will be built in the Valley of Mexico, equivalent to half the railway lines built in 40 years. By 2009, remarked President Calderón, it is estimated that over $600 billion pesos will be assigned for infrastructure, more than the amount allocated to the remodeling of the Panama Canal.